Rocky Mount, NC Bojangles'® Tands, INC. Store #15 - Bojangles'® / Tands, Inc.
Rocky Mount, NC loves the great food, low prices and fast, friendly service at Bojangles’®! If you’re craving crispy fried chicken, fresh homemade buttermilk biscuits and southern sides like mac’n’cheese, Cajun Pintos’ and green beans, Bojangles’® in Rocky Mount has a meal that will hit the spot. We open early to serve breakfast and coffee to perk up Rocky Mount, NC in the morning, and the Bojangles’® menu has great options for lunch and dinner as well! 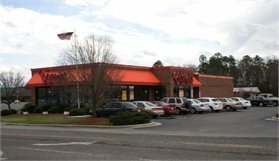 This Rocky Mount Bojangles’® is in an area with several Rocky Mount, NC retailers, so we’re the perfect place to stop and shop! We are also a favorite place for Wesleyan College students to stop for a bite to eat.